EAST BEND — On Wednesday night, the No. 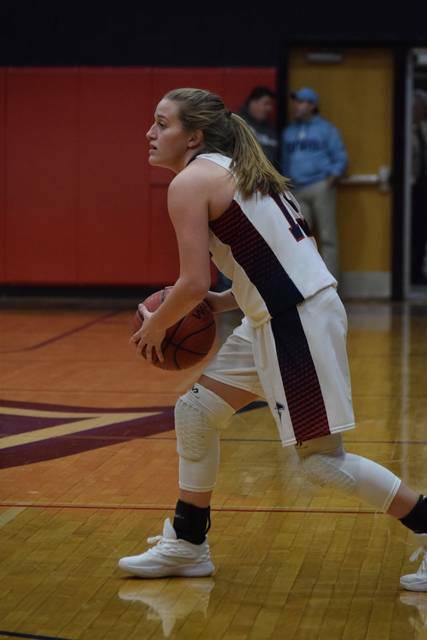 10 ranked Forbush Falcons women’s basketball team hosted its cross-county rival, the Starmount Rams, in a blowout game. Forbush put on a show for its fans as they took a 64-12 non-conference win on their home court. It was a big night for the Falcons as they continued their four game win streak. Things started out in Forbush’s favor, as they outscored the Rams 23-0 in the first quarter. The Falcons played tough on defense and had an aggressive offense which helped them take the lead. The first basket of the night came from the hands of Junior Hope Grimes. Grimes was set up on the left arc and caught the bounce pass from Parkley Hennings. Grimes stepped back and sent her shot through the air and it swished through the net. With 24 seconds gone, Forbush led the Rams 3-0. 30 seconds later, the Falcons were back on offense and determined to extend its score. Nicole Scott took the ball down the court and saw her chance to put her name on the score-sheet. Scott knocked down a three-pointer from the top of the arc for a 6-0 Forbush lead. The Falcons kept pounding on offense with a basket by Hennings for an 8-0 lead. On defense, Forbush also had all of the momentum. At the five minute mark, Grimes managed to steal the ball from Starmount and come up with a breakaway. Grimes hit her lay-up with ease and the Falcons had a double digit lead. As the first quarter continued on, Forbush kept knocking down its shots while the Rams struggled to find their opening basket. Forbush had five different players score in the first quarter – Scott, Grimes, Hennings, Alexis Ball and Morgan Beane. At the end of the first eight minutes of play, Forbush had a 23-0 lead over the visiting Rams. 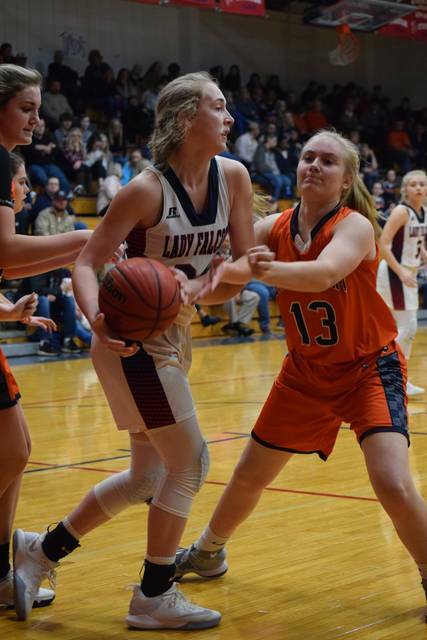 In the second quarter, the Falcons racked up six additional points before Starmount was able to break Forbush’s scoring run in the fifth minute. Emma Freed powered her way through the red and blue defense to put up the first points of the night on Starmount’s side of the board. With 5:02 left before halftime, Forbush led the Rams 29-2. Before the quarter was over, Starmount put up another point with a free throw by Katlyn Walker. On the opposite side of the court, Forbush knocked down shot after shot to take a 40-3 lead at the break. After the break, Forbush kept its tempo up as the outscored the Rams 10-7 in the third quarter. Forbush’s points came from Hennings, Kyndall Ellison, Meghan Anthony and Brittney Gammons. 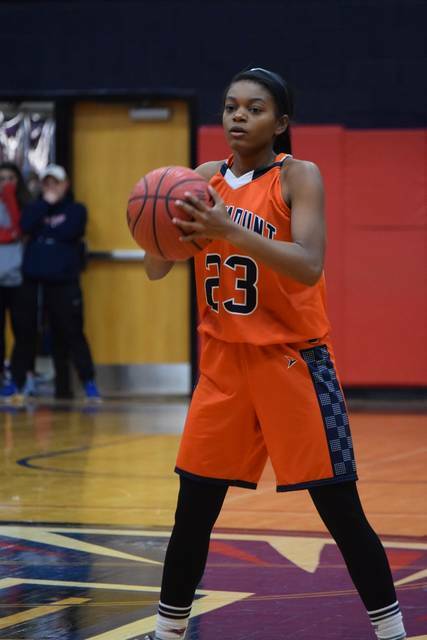 Starmount’s points came from Olivia Gwyn, Tanna Sagraves and Freed. At the end of the third, Forbush led the Lady Rams 50-10. In the final quarter, Forbush had another reason to celebrate as Hennings scored her 1,000th career point. The play was set up by Scott as she made her way down the court. Scott saw Hennings under the basket and passed her the ball. Hennings hit the shot with ease and she had officially hit a milestone with 1,001 career points. The rest of the quarter was smooth sailing for the Lady Falcons, as they continued to put pressure on the Lady Rams. Starmount managed to score two points, while the Falcons scored 14. When the buzzer sounded, Forbush took a 64-12 win over the Starmount Rams. Hennings led the Falcons with 17 points, while Scott had 14. Ashley Collins had 10 points, Alexis Ball had eight, and Grimes had seven. Ellison had four points, Anthony had two, while Miranda Bellanger and Morgan Beane both had one point. For the Rams, Emma Freed had five points, Katlyn Walker had three points, while Tanna Sagraves and Olivia Gwyn each had two points. Starmount and Forbush will match-up again on Monday night. Tip-off will happen early, as the Rams do not have a JV girls team. The JV boys game starts at 4:30, with the varsity girls game to follow. Nadia Rucker takes the ball down the court for the Lady Rams. Parkley Hennings looks for an open player while Blythe Freeman defends her. Hope Grimes had seven points for the Lady Falcons.